How to Research and Find an Ideal Yoga Retreat in India? Home » 200 hour yoga teacher training retreats » himalayan yoga » rishikesh yoga retreat » yoga in himalayas » yoga retreats in india » How to Research and Find an Ideal Yoga Retreat in India? Peace is a state of mind and therefore sometimes even the most exotic locations in the world can’t get rid of the stress and anxiety. 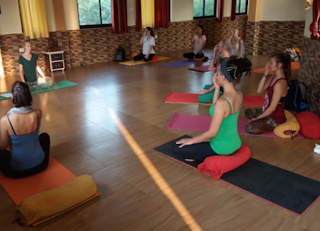 If you are planning to escape your mundane routine and make use of your time to relax and unwind, or if you want to get some yoga teacher training you can look for yoga retreat in India. Retreats for yoga are a great way to get away from the noise and clutter of the city. India is known as the origin of yoga and therefore you can find some of the great yoga retreats here that offer the best yoga learning experience. While you are searching for India yoga retreat you need to keep in mind that different retreats have different goals and therefore you need to know that before you enroll. You need to learn more about the objective of the particular yoga retreat and see if that matches well with your personal aspirations and expectations. If the program does not give you a sense of benefit you might want to talk to the coordinator and see if they can guide you with how the retreat program can help you. Rishikesh is known as the yoga capital of the world and therefore you can look for a yoga retreat in India that fits your requirements. If you are interested in making a career from yoga Kaivalya Yoga School provides 200 hour yoga teacher training retreats where you can yoga practices necessary to make the most of your relaxation experience.